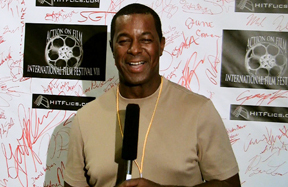 Superstar and athlete, Dwight Hicks is featured in the Action On Film 2011 Interviews. The two time Superbowl Champ (San Francisco 49ers) has turned his considerable talents to the big screen in the Award Winning action thriller, "DISRUPT/DISMANTLE" (aka "CARTEL WAR") where he plays a high ranking police official caught up in a drug war, right in the middle of Los Angeles. Roberto Sanchez is nominated for Best Actor in the Texas Black Film Festival!